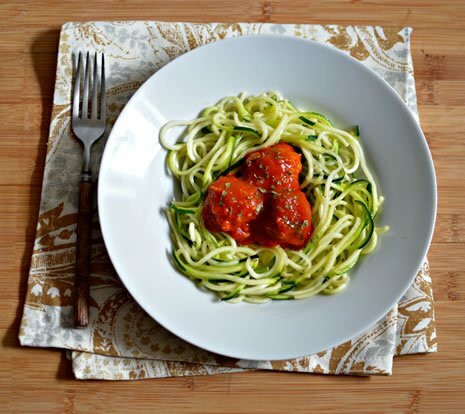 Gluten Free Meatballs & Zucchini "Noodles"
This gluten free version of meatballs with zucchini noodles is great for Passover. The meatballs are half chicken, half beef, with no breadcrumbs, and I’ve replaced the spaghetti with zucchini noodles. What are zucchini noodles? 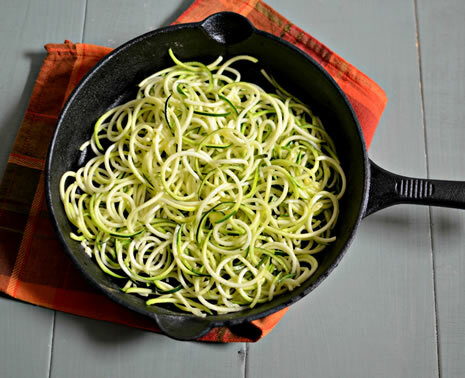 Simply, zucchini passed through a spiralizer which turns them into the noodle shape. They’ve caught the Internet by a storm over the last couple of years, and for good reason. Do they taste exactly like spaghetti noodles? Nope. But unless you are particularly averse to zucchini, I’m sure you’ll enjoy these. You will need a spiralizer of some sort. There are different types, but I prefer the standing ones. Because zucchini has a very high water content, you want to absorb as much of the moisture as possible before you cook them, so they don’t become soggy. You can do this by putting the spiralized noodles between a few pieces of paper towel and gently pressing down. Let it sit for 10–15 minutes, and replace the paper towel if necessary. Note: You can prepare the raw zucchini noodles a few days in advance. Store, refrigerated, in an airtight Ziploc bag, with a couple of pieces of paper towel. You’ll want to cook the zucchini noodles very quickly over high heat. A good dose of salt is also important for flavor. Form the meatballs. I used half chicken and half beef, but you can use all chicken or all beef, if you prefer. Simmer until cooked through. Try not to overcook them, so they don’t dry out. Serve over zucchini noodles and eat immediately. If you want to serve later, keep the noodles and meatballs separate. Mix all the meatball ingredients (except the oil) together gently. Do not overmix. 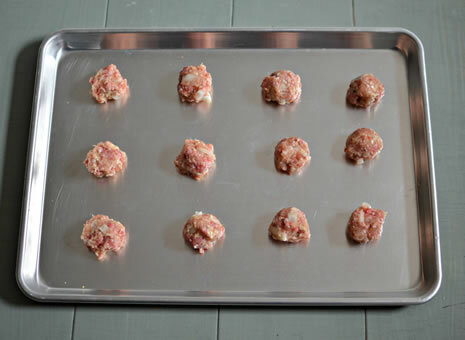 Roll the meat mixture into evenly sized balls and heat the oil in a frying pan. Drop the meatballs into the oil and brown on each side. Add the marinara sauce and the water to the frying pan, and simmer for about 30 minutes, until meatballs are cooked through. Do not overcook. 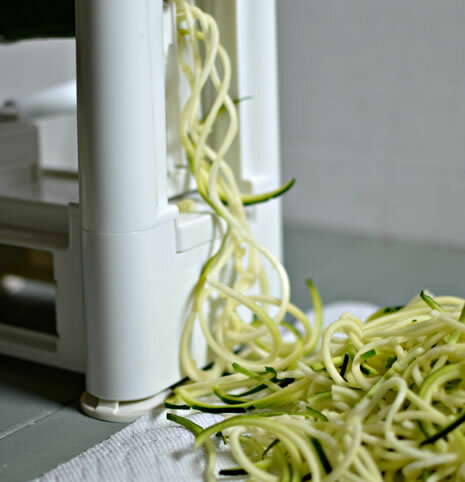 To make zucchini noodles, you’ll need a spiralizer of some sort. Spiralize the zucchini and put it on a couple of pieces of paper towel. Cover with paper towel and press down to absorb some of the moisture. Let zucchini sit for 10–15 minutes. Replace the paper towel if necessary. To cook, place 2-3 tbsp. oil in a frying pan over high heat. Once the oil is very hot, add the zucchini and the salt, and toss it for 2 minutes or so. Be careful not to let the zucchini overcook and become soggy and watery. (Depending on the size of your frying pan, you might need to do the zucchini in several batches. You don’t want to overcrowd the pan.) Remove from pan; serve immediately. 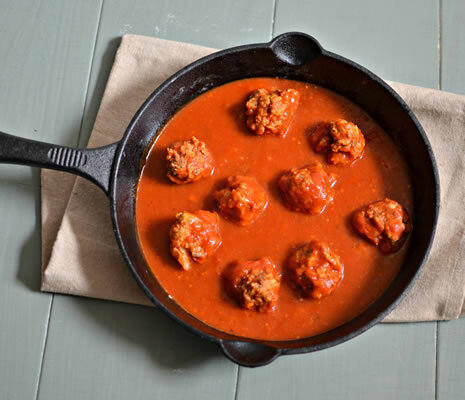 Top with meatballs and sauce.